Model T Ford Forum: What happened. It ain't broke and it still works but it's not right ? What happened. It ain't broke and it still works but it's not right ? Model T Ford Forum: Forum 2014: What happened. It ain't broke and it still works but it's not right ? Well sir, We adjusted the low band on our Speedster #22 at the Murietta, CA Fast Four Hill Climb due to low speed slipping and it ran very well. In fact we were the quickest flat head T there that day after getting it adjusted correctly. When we got home we looked at the clutch pedal and found that it had moved outboard to the left was touching the Bendix can. When we screwed in the low speed band adjuster the low pedal simply walked out to the left. What holds that pedal in to the right ? There is plenty of band lining in place and they are wood. Is there some sort of a lock or cam on the clutch pedal that has come loose ? We put three flat washers under the claw on the right side and when the screw is turned in, the pedal is pushed to the right by the spring. The screw is not pushing the pedal by direct contact as there is almost an inch of space in there between the adjusting screw and the clutch pedal shaft, just the spring is doing it. Not much pressure on it at all. Any hints ? Maybe the pin that attaches the low speed cam to the pedal shaft has or is getting ready to shear? Could it be that the braded on slow speed notch pin has let go and allowing the shaft to drift to the left? I don't see how the pin is sheared but anything is possible I guess. Just a thought about what has happened. Mark you beat me to the same conclusion! If the pin was broken or fell out, the low shaft would not turn the notch. However, if the cam and/or the notch were worn out, it could cause the pedal to move to the left. At any rate, you need to find out the cause and fix it before continuing to drive. If the pin fell out, it could get stuck in the magneto or other internal parts and cause a very disappointing result. Another problem that can happen when the band lining becomes too worn, would be that the end of the adjusting screw hits the pedal shaft and it cannot be adjusted any farther. But the cam and notch would still prevent the pedal from moving to the point it touches the starter bendix cover. So I still think your cam and notch are worn out. Or the shaft is VERY tight in the notch and tight enough to apply the band, but will slip sideways when you push the pedal or adjust the screw. That last sentence should be that the pin is out or sheared, but the shaft is VERY tight in the notch and tight enough to apply the band but will slip sideways when you push the pedal or adjust the screw. There are two pins to check for on that pedal shaft. The pedal to shaft pin, and the shaft to cam pin. Either one could shear and cause that problem. Really unusual though. Usually, if either pin shears, the shaft rotates inside the part (pedal or cam) and pulls out a little, then quits working totally. That you still would have any function at all would be very unusual. Maybe if the shaft is somewhat rusted into place it would hold for a bit. But I can't think of anything else that would cause those symptoms? I can't see any broken parts. 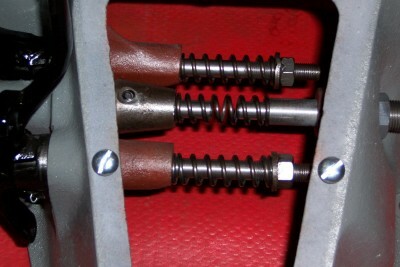 The pedal can't be pushed inboard unless the spring is removed. As soon as the spring is re-inserted the pedal moves to the left and hits the Bendix can. Yet there is no slip and the collar moves with the pedal as the clutch is depressed. You will notice what you call the collar. That is actually called the "low speed notch" It rides against another part which is bolted to the inside of the hogs head called the "low speed cam". As one depresses the pedal, the action of the friction between the notch and the cam pushes the shaft toward the right moving the ear of the band to apply low gear. Over the years, those two parts cam and notch can wear to the point that the pedal keeps moving farther left when in high gear or neutral. I think you need to replace the cam and the notch with replacement parts available through the parts suppliers. I have replaced these parts on two Model T's and have had some problems with the alignment of the holes drilled for the pins. You might need to find someone locally who can help you get it right. Or I can come up and help you if you get all the parts, shaft, notch, and cam with the pins and if you pull off your hogs head. I can come up and help you fit the parts. It should take only an hour or two time if you get all the parts and have the hogs head off. Remember to get the hogs head gaskets too. Be sure to remove the bendix from the starter before removing starter. Remove the starter before removing the hogs head. Only payment I ask would be for you to buy my lunch.